The round body of the model with a diameter of 46 mm made of stainless steel. Very original look of steel bezel with ceramic inserts. 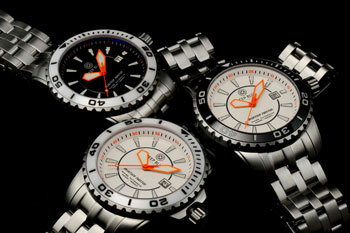 New available in several color versions of the dial: milk, bright orange, matte black, bright green, blue. The dial is equipped with overhead hour markers and three arrows, covered with luminescent coating. In the central part of the dial is a circle in the upper part of which is placed the logo mark, and at the bottom – the model name. In “3:00” is a square aperture of date. Protects the original dial sapphire crystal. Supplied BlueTech Master 500 model on a metal bracelet of stainless steel, which is compatible with the diving suit. Equipped with new Swiss automatic movement ETA 2824-2 at 25 stones, with a balanced frequency of 28,800 vibrations per hour, 40-hour power reserve. Caliber is equipped with features hours, minutes, seconds and date display. 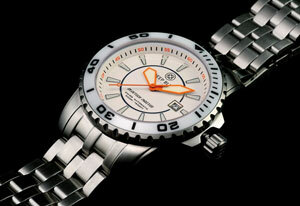 Model 500 is equipped with BlueTech Master 500 meter water resistance. Buy watches BlueTech Master 500 from Deep blue marks possible for $ 699.